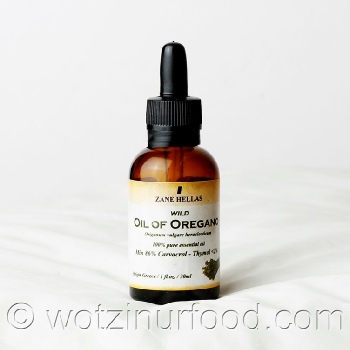 Zane Hellas Oregano Oil: Oregano is a perennial plant that grows in many parts of the world. It is an aromatic and medicinal plant with healing properties known since ancient times. Perhaps the best oregano in the world grows in GREECE and is known worldwide as GREEK oregano. The temperate climate of Greece, the sunshine and rich in subsurface data make GREEK oregano perhaps the best in the world. From this oregano, wild from the GREEK mountains and organic (non GMO) we make the essential oil of oregano that we offer. Carvacrol is the main ingredient of oregano oil. The higher the content of carvacrol in oregano oil more efficiently is. If the oregano oil is low in carvacrol then it will not be as effective regardless of the dosage usable. Thymol is another ingredient found in oregano oil. It must be at very low rates in the oregano oil because thymol is toxic in high concentrations. You should always seek the Certification of the Analysis in oregano oil. These are the basic things that you should see there: a) the plant variety and the way of distillation. b) the percentage of carvacrol present in oregano oil. c) the percentage of thymol present in oregano oil. Origanum Vulgare Heracleotic is the variety 100% pure essential oil of oregano. The best quality in the world. 86% CARVACROL Minimum Rating Less than <2% THYMOL 100% wild and organic, 100 % Steam Distilled. No chemicals used in the process. Alcohol free, Pharmaceutical Grade, Therapeutic Grade. Analysis and certification of each production batch 1 fl.oz. – 30ml of Greek Oregano Oil from the Greek mountains. The essential oil of oregano is known since time immemorial that help in many cases. There are many published studies on its effectiveness. Some of these are: Allergies, Antifungal, Antioxidant powers, Arthritis, Asthma, Athlete's Foot, Back Pain, Bacterial infections and parasites, Bug Bites, Bee stings, Bronchitis, Diaper rash, Digestive problems, Candida Yeast, Common Cold, Cold Sores, Colitis, Diarrhoea, Earaches, Eczema, Flu, Gum Disease, Immune system boost, Migraine headaches, Muscle Pain, Nail fungus, Osteoarthritis, Psoriasis, Parasites, Pain relief, Rheumatism, Ringworm, Sinusitis, Skin rashes, Tooth Pain. You should always dissolve the essential oil of oregano before use in extra virgin oil or water. A good ratio is 1:10 (10%) to 2:10 (20%) (10% is one drop of oregano oil, 9 drops of olive oil). You can use it internally or externally. Internally should dissolve in olive oil and Get 4 drops - twice a day. For best results it is advisable to share doses throughout the day and drink a lot of water. If you use externally should not be forwarded to the open wounds. Please do not use oregano essential oil if you are pregnant or breast-feeding ,if you are allergic to thyme, basil, mint, or sage. Always dilute the oregano oil before use and use wisely. Keep away from children and eyes - skin. For the trio protocol, use 6-8 ounces of juice or water, drop 2-4 drops of oregano oil onto water. Sprinkle one teaspoon of Regulate powder followed by one teaspoon of Diatomaceous Earth onto liquid. Allow to settle for 5 minutes, then drink in one mouthful. Follow up with a swirl of water to use up any sediment. Because this combination of products are so effective and powerful in killing and removing parasites and yeasts in the body, some people may initially feel poorly. This is normal as it is a result the product is working, and is commonly known as a Herxheimer Reaction. To off-set this, you can start off by taking 2 drops of Oregano Oil instead of 2 drops, and maybe half the powders. Also, take plenty of water to help flush the dead bacteria from your body.